The end of the school holidays will have brought mixed feelings to many parents of children with additional needs. For some, the start of a new term will mean an unwelcome return to early mornings, eye-watering logistical operations just to get our kids where they need to be before 9am, or having to tackle school refusal or high levels of anxiety. For others, it will bring the relative calm that comes with the return of a more structured routine. It might mean the resumption of clubs, activities and support groups that all but grind to a halt when the schools break up. Or it might mean the return of that few extra minutes in the day to catch up with all those forms that need completing and equipment and appointments that need chasing. Maybe it will mean just reminding yourself of what that strange thing you’ve heard tell about called a hot cup of coffee tastes like. For working parents of disabled children, the start of term will likely give rise to additional feelings. On the basis of the conversations that I have been having with friends in this position over the past couple of months, chief among these emotions will be relief. It’s not, of course, that they don’t want to be with their kids. It’s not that they don’t want a holiday themselves – and boy, don’t we all deserve one? It’s just that school holiday childcare options or activities for children with additional needs are far fewer than for their non-disabled siblings and friends. In fact, they seem about as elusive as that warm americano. In the past couple of years, much has been done by organisations such as Every Disabled Child Matters (EDCM), Contact a Family, Working Families UK and Family and Childcare Trust to highlight the educational, social, financial and emotional costs to children, parents and the economy of forcing carers of disabled children out the workforce due a to lack of inclusive childcare provision and the often prohibitive additional costs incurred. Last year, I was fortunate enough to be asked to participate in the Parliamentary Inquiry into Childcare for Disabled Children and to contribute to its report on this rather sorry state of affairs. I wish I could say that the Inquiry has changed things. Sadly, I can’t. 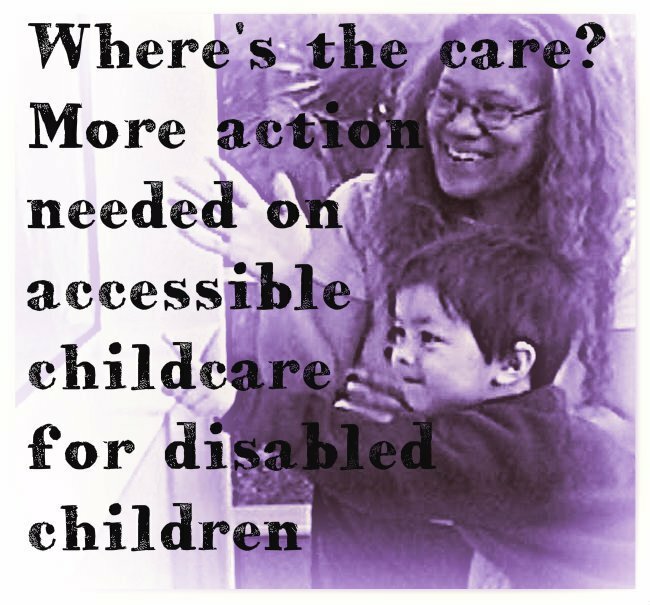 But the momentum has not been lost, and we are watching the progress of the Levelling the Playing Field campaign for childcare for disabled children with great interest. Much of the attention of these initiatives so far has been focused on preschool children, like my own child, being able to access the 15 hours of ‘free’ educational term-time entitlement. But what happens to those children outside of term time? What happens when they start school? You might think things would get better or easier. Many parents of these children tell a very different story, however, and one that needs to be heard much more loudly, I think, than it currently is. I have spoken to a number of parents who have been struggling to hold onto their jobs over the school holidays. Some reported very few or sporadic holiday childcare options in their local area for their disabled children in comparison to what is available to their non-disabled siblings. Some said there were absolutely none in their Local Authority for particular age groups - under 5 or over 11 seem to be particularly under-represented - and flat refusals from Local Authorities to consider transporting children out of area for what is considered ‘recreational’ care. Other options, such as a childminder, can be problematic too. Many of our children need 1:1 support, which usually makes a childminder out of the question or means that the cost of a summer holiday place can double or in some cases treble to compensate the child-minder for a loss of other business. Then there is the access question. How many child-minders have accessible properties? Of course, there is the option of care in our own homes by hiring a nanny who does wrap around care. Finding such a person can be very challenging, however, since it’s often not a financially viable option for the individual providing the care. Then there is the question of experience and safety. I spoke to one parent who can’t employ a nanny in her own home, even if they could afford one, because her child is above the legal hoisting weight and lives in a non-adapted home. The report that was produced following the July 2014 Parliamentary Inquiry clearly laid out the benefits to disabled children, their families and their local communities of making it possible for kids with additional needs to access the range of educational and recreational child care that non-disabled children can access. More than a year on, however, working parents are no nearer to finding reliable options for holiday childcare and are struggling to keep their jobs, incomes and homes as a result. There is no doubt that all parents of disabled children, whether they are in paid employment or not, work really hard. And we all have to work really, really hard on top of this, just to ensure that our children can learn and play. The lack of accessible childcare and summer holiday activities for disabled children is just another barrier to these experiences, which so many of our children’s brothers, sisters and peers can take for granted. Surely this needs to change. If you know of a good wraparound or holiday care scheme for children with additional needs we would love to hear about it. Research by Contact a Family indicates that 82% of working parents whose children access childcare pay ‘above average childcare costs’. Mrboosmum is the mother of two children, one of whom has quadriplegic cerebral palsy and epilepsy as a result of his premature birth two years ago. She blogs about her experiences of raising her children over at Premmeditations.